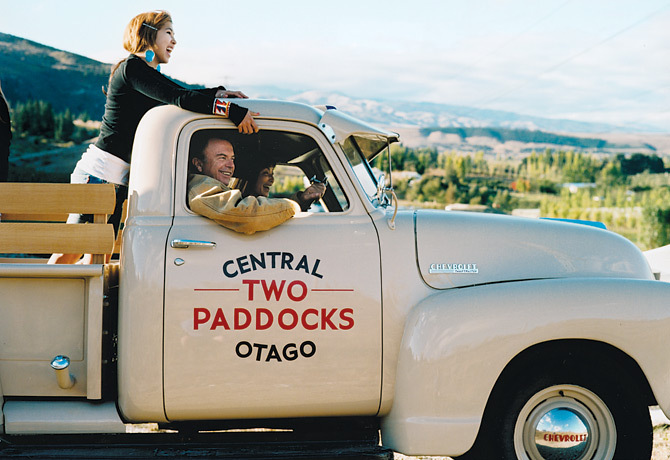 Sam Neill, with his wife, Noriko Watanabe Neill, and daughter, Elena, tends the land at Two Paddocks, their Central Otago family-run winery. Call it a sideways moment. New Zealand vintners Sam Neill and Adam Peren are surveying a rugged hillside vineyard and discussing why Pinot Noir is the most sensuous and elusive of wines. "If Pinot were a woman, she'd be Audrey Tautou in Amélie," says Neill. "Kristin Scott Thomas," offers Peren. "No, Kristin's a dry Riesling," Neill insists. One guesses Neill might know, given that he co-starred with Scott Thomas in 1998's The Horse Whisperer (although he did not appear in the Oscar-nominated 2004 Sideways, which established Pinot Noir as the grail of grapes to a global audience). Neill, who has more than 60 movie credits under his belt and who recently appeared on TV as Cardinal Wolsey in Showtime's The Tudors, leads something of a double life. Back in his native New Zealand, this son of three generations of importers of French vintages planted his first five acres (two hectares) of grapes in 1993. Neill has poured heart and soul not only into such successes as The Piano and the Jurassic Park movies but also into the alluvial-schist soil of the South Island of New Zealand, where his great-grandfather settled in 1859 and where Neill helms Two Paddocks, which is dedicated to the quest for what he calls "the seductive Pinot Noir." Those who recall the debates of Miles and Maya in Sideways (which, winemakers concur, has had a considerable influence on the popularity of Pinot) might remember that Pinot Noir can be unpredictable yet potentially spectacular. Part of the appeal lies in the fact that the vines thrive only on such steep slopes as Burgundy's 2-mile-wide (3 1/2 km), 30-mile-long (50 km) stretch of C�te d'Or (Burgundy and Pinot Noir are synonymous) and in just a few rocky pockets in such places as Australia, Canada, South America and Europe, along with Oregon's Willamette Valley and the coolest spots in California. As for New Zealand's Central Otago Pinots, the pioneers who planted this epic landscape with vines in the 1970s were deemed madmen. With its craggy peaks and glacial valleys, Central Otago would appear to be the last place you could grow grapes. Located below the 45th parallel near the tip of New Zealand's South Island and with elevations of 650 to 1,475 ft. (200 to 450 m) above sea level, this is extreme-sports country. The world's top snowboarders compete on mountains buffeted by winds from Antarctica. In fact, Pinot vines don't mind a blanket of snow as long as summer temperatures are warm enough for the slow ripening needed for intense flavors and complexities to develop. "Pinot Noir is not one of those grunty, stand-a-spoon-up-in-it wines. It's fickle and voluptuous and complex," says Neill. "People say there's a lot of wine in the world, but there's not a lot of Pinot Noir, and admirers are looking for regional differences." Worldwide, Pinot Noir's uniqueness is that it seems to carry in the most pronounced way the taste of the land from which it hails. (The French refer to this as the goût de terroir.) "Pinot from here does seem to reflect the mystery of this place," says Neill, whose merchant great-grandfather arrived during Otago's gold rush and grew wealthy from selling supplies, including alcohol, to miners. "So your family have been peddling hooch around here for 150 years," jokes Peren, who hails from such quintessentially Kiwi stock  as New Zealanders would call it  that his grandfather even had a breed of sheep named after him. Peren launched the Peregrine Wines label in 1998 in partnership with oenophile oncologist Murray Brennan of Memorial Sloan-Kettering Cancer Center in New York City. (Brennan visits for vacations.) Peren's connection with the land that Peregrine has under vine comes through his wife's grandfather, who won a small plot in a card game. The Peren family also has a single-vineyard Pinot Noir called Two Sisters. A great Pinot may taste heavenly, but it's a devil of a job to get it into your glass. Birds love the sugar-laden grapes (hence the surreal sight in early fall in Central Otago of what appear to be snow-filled valleys, which are in fact a vast expanse of white nets). If the grapes aren't picked exactly as they reach maturity, the thin-skinned berries shrivel on the vines  which, because they thrive on steep slopes, demand that harvesting be done by hand. Yields are low  about 2 tons per acre (5 metric tons per hectare, which translates into about 350 cases of wine). Sauvignon Blanc vines would yield three times as much. Add to that the risk that the fruit will be unstable during the fermenting process (although we'll forgo the science lesson on the effect of Pinot's native yeasts and 18 amino acids). But the greatest enemy of all needs just one night to destroy everything. While vines don't mind snow, grapes hate frost, and the only reliable way to stop cold air from killing a crop is expensive and terrifying. Neill and Peren, along with the other winemakers in a region that features such wine stars as Felton Road and the well-named Mt. Difficulty, are all too familiar with frost watch, which means helicopter flying at night. To keep the air moving, squadrons of choppers fly low, a maneuver rendered yet more perilous because the valleys are crisscrossed with electricity cables. "It scares the hell out of me," Neill admits. "We're desperate to find an alternative. We do use windmills too, but the problem is, on one night your windmill might not be in the right place." It was the Sauvignon Blancs of the Marlborough region farther to the north  including Cloudy Bay, now owned by French luxury group Mo�t Hennessy Louis Vuitton  that really put New Zealand wines on the map. Yet plenty of wine connoisseurs remained skeptical about Central Otago Pinot Noir. Neill makes sure to credit his mentors: the late Rolfe Mills of Rippon winery, who started to plant in 1976, and Alan Brady, who today co-helms a two-man boutique winery called Mount Edward. "It's a small region, and we cooperate with each other," says Neill. "Everyone helps everyone else and pools their knowledge." Rippon, now operated by Rolfe's son Nick Mills, is also significant because, situated on the banks of Lake Wanaka, it has what must surely be the most spectacular cellar-door point of sale on earth, attracting some 15,000 wine tourists a year. Peregrine Wines, too, has a robust cellar-door business, as do other wineries in Central Otago. But don't turn up at Two Paddocks. "We discourage it by being hard to find, because I like wandering around with my shirt off," says Neill, who prefers to drum up sales via a terse and amusing blog. As for how he splits his time, Neill notes that both his professions are "very chancy and very weather dependent." But wine can be much harder work. "I certainly wouldn't turn down a great acting gig so I could be on my hands and knees putting grapes in a bucket," he says with a laugh.